Cash or cheque using numbered weekly offertory envelopes. Standing order through your bank or building society at a frequency determined by yourself. Cheques paid annually or at any other regular frequency. Gift Aid makes a tremendous difference to the income that the parish receives. We can recover 25p in every £1 of any donations that are given by taxpayers by any of the options outlined in the planned giving scheme. Gift Aid does not cost you anything extra and does not have any effect on your own tax position. That the donor should be paying, or expecting to pay, income tax (or capital gains tax – rare for most of us [not true!]) of at least the amount which will be reclaimed by the Church. This is 25p in the £ of what is given, one quarter for quick calculations. This does not require any extra payment and in most cases will not cause any difficulty. For example, somebody giving £5 per week will have to be paying tax of no less than £1.25 per week. 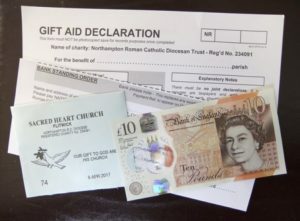 That the donor should make a declaration that he/she is a taxpayer and willing for donations to be included in the Gift Aid scheme for the benefit of the parish. That the Church can identify, trace and record all Gift Aid donations. This is why loose cash in the collection cannot be included in the Gift Aid scheme. You have to be using offertory envelopes, a bank standing order, or an ordinary cheque.